Your floor is a blank canvas: Put it to use by using your logo mat to advertise, brand, or provide a welcoming message to your customers. If you had a billboard, you’d never dream of leaving it blank, right? Well your floorspace is just like a billboard in your building! By making the most of it with a logo mat, you’ll leave a lasting impression on your customers. 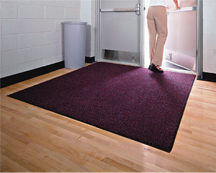 Walk off mats are a great way to prevent dirt and dust from entering your office, facility, or building. But that’s not all they’re good for! When a walk off mat is personalized with your company’s logo, your facility can benefit from improved cleanliness while also proudly showing off your brand. Eye-catching and functional, logo mats are a great addition for any type of business. Walk off mats like this can be personalized with your message, logo, or advertisement! Our walk off mats are made from a special material that is designed to trap the dirt and debris that is carried on shoes. In fact, a high-quality walk off mat like the ones offered by Lord Baltimore can trap up to 80% of dirt that would otherwise enter your facility! That means your employees will be able to spend less time cleaning and you can be confident that your lobby or front entrance will always look great. Logo mat combine the effectiveness of our walk off mats with the endless possibilities of a billboard. By enhancing your walk off mat with your company’s logo and placing your mat on your front doorstep or portico, your brand will be the first thing that your customers see as they come into your building. However, you don’t have to stop with just your logo. We can customize your floor mat with virtually any type of information that you desire. This entry was posted on Thursday, July 14th, 2016	at 2:35 pm	. You can follow any responses to this entry through the RSS 2.0	feed. Both comments and pings are currently closed.